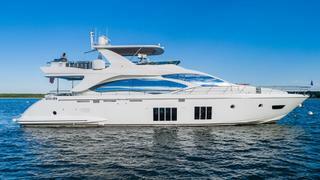 The 25.7 metre motor yacht Satisfaction has been listed for sale by 26 North Yachts in Florida. Built in GRP by Italian yard Azimut to a design by Stefano Righini, Satisfaction was delivered in 2017 as one of the yard’s AZ 84 flybridge series. An interior by Salvagni Architetti accommodates eight guests in four cabins comprising a master suite, VIP suite, double and a convertible twin. All guest cabins have entertainment centres, television screens and en suite bathroom facilities while crew quarters sleep three staff aboard this yacht for sale. A luxurious main deck saloon has an L-shaped settee to port facing two club chairs on the starboard side and boasts a white onyx bar and an entertainment centre including a 55-inch television screen on a rise and fall mechanism. Forward is the dining area and a fully-equipped galley. The aft deck offers al fresco dining and entertainment at custom teak tables while up on the flybridge is an L-shaped outdoor dining area, full bar and fridge sheltered by a hard top. In addition, the foredeck has a sunbathing area that comes with a removable parasol. Twin 1,800hp MAN diesel engines allow a cruising speed of 24 knots topping out at 29 knots and she is fitted with CMC zero speed stabilisers. Lying in Fort Lauderdale, Florida, Satisfaction is asking $3,950,000.